There is no hard-and-fast rule to determine which wine goes well with a particular food. Foods and wines are defined by their unique texture and flavor. The perfect combination of texture and flavor is the key to make food and wine a pleasure to enjoy since a good pairing between the food and wine can bring out the joyous moment for the guests. There it is very much important to find a good match of wine and food considering the time, tradition, and culture we can choose the right food to complement the wine. If the server will be aware and informed about the correct pairing of food and wine which is traditionally acceptable then he/she can suggest the guest while taking order which is also a good mark of a hotel. But if the guest asks for a different paring then the server should never criticize guest’s selection and serve according to guest preference because everyone has different individual taste. The dry, light wines are served as an appetizer or beginning of the meal and medium-dry wines are served with the main course. Red wine goes well with red meat (beef, lamb, duck or game). If a dish is cooked in wine then it is best to serve the food along with wine of that variety. Any regional food is great combination for wine of the same region. The full bodied wine should be served with rich and heavier food. Champagne is basically served throughout the course of meal. Cheese dishes always complemented by port and red wine. Dessert wines is best served with dessert and less acidic fresh fruits. Wine should never be served with salads with vinegar dressings or curries since the tastes will be overpowering. 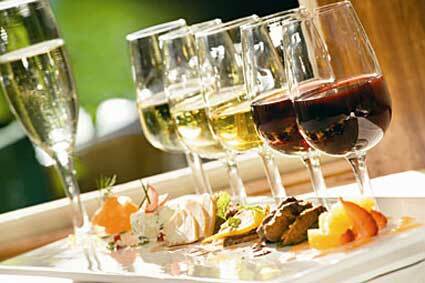 Sweet wines are always served with those foods which contain less sweet. Cheese Dishes Cabernet Sauvignon, Pinot Noir, Riesling (but the cheese should be fresh to uphold the flavour of wine).